In a chatoyant gemstone, the band of light will move back and forth beneath the surface of the gem as it is turned into a beam of incident light. The motion of the cat’s eye across the top of the gem is one of the things that make these stones so interesting, beautiful, and desired by many people. 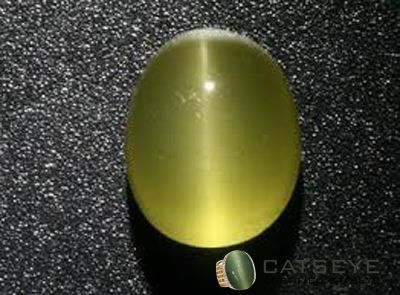 The chatoyancy in gemstone chrysoberyl is so prominent that the term cat’s eye has come to be used exclusively for it. So it should be understood that a cat’s eye is not a gemstone per se but the name of a phenomenon. Besides, cat’s eye, the tiger’s eye stone is also referred by this name due to its Chatoyancy effect. In Chatoyancy stone the light wave moves back and forth underneath the Chatoyant gem surface when it is kept or placed under the beam of light. The beam of a light wave will shift or displace if the observer moves his/her head or stone position is altered to observe stone from different angles. Chatoyancy is observed in varying forms. First is the regular band of light that distinctly stretches across the stone. Second is the ‘opening and closing effect’ where there are two bands visible across the stone. The cat’s eye gemstone can be produced with cabochon gemstones. Thus, those gem traders who have the intent of producing cat’s eye stone must first choose that stone which has a large number of silk inclusions present in the stone. And the gem cutter should carefully select a rough gemstone so that the parallel inclusions or silk inclusions remain beneath the stone and parallel inclusions remain parallel to the long axis of chatoyancy basically occurs in those stones that possess a large number of parallel thin inclusions inside the stone also termed as “Silk”. The wave of light, when struck this parallel inclusion, forms a band of light underneath the stone surface. The band of light will generally appear at right angles to the length of alongside inclusions. These inclusions are aligned toward the crystal axis and these inclusions can be named as hollow tubes, crystal or other linear structure that are present in the stone. Unfortunately, if a gem cutter fails to accomplish the above-mentioned goal, then a clear cat’s eye stone will not be produced. If a stone features all of the above criteria and has an exceptional body color, then you have a fantastic cat’s eye stone.